Are Publishing Choices Confusing You? Hugh Howey has produced another insightful AuthorEarning’s report, this time focusing on the impact of Kindle Unlimited (KU), which is Amazon’s ebook service launched this summer. According to Howey, and based on what I’ve read elsewhere, it’s possible that KU might be hurting sales for self-publishers. According to Howey, the reason is that ebooks downloaded from KU earn the same amount as a sale for traditional publishers but for self-publishers payment depends on how much money is in the shared pool of funds. For the October report, Howey’s team pulled data from 120,000 ebooks off of Amazon’s data product pages, which is his largest snapshot of the industry to date. The first five charts in Howey’s report focus on five different assumptions about the KU borrow rate, and what it could mean to an author’s income. He then goes on to assess daily sales rates and other data. As Howey notes, these snapshots started only nine months ago and might not reflect true and consistent trends in ebook sales. It will be interesting to see if next year’s reports differ significantly from what he found this year. Howey’s findings show that KU does seem to have an impact on ebook rankings, visibility, and therefore potential income for self-published authors. I know that indie authors have been complaining about it for weeks on various forums, so he could be right, but I’m not sure if the impact affects all genres or all authors. Howey states there were 2,908,475 ebooks sold on Amazon, and that 25.6% of them are available through the KU program at the time he prepared this latest report. Of those 25.6% available, 20% of them are on KU’s bestseller list and sub-lists. You can read a lot more information and interesting stats by reading the full report. Author Earnings reports were created to help authors make clearer choices about how to publish and sell their books. I think the intention was good, but after studying all the material and charts, and reading all the explanations and interpretations of Howey’s findings over the past nine months, I still have no idea which publishing option would generate the best income for me. If I was to self-publish, should I go with KDP or not? KU or not? CreateSpace or not? Of course, my royalty rate would be higher than it is with a traditional publisher, but would I sell enough copies to cover the cost of hiring a jacket designer and good editor? Despite the growing number of self-publishers making a living from writing, the overwhelming percentage of authors are not, based on stats from different sources. While I appreciate the time and trouble Howey has taken to compile all that data, the decision about publishing choices is more perplexing than ever. I'm nothing if not thrifty. I posted this on the amwriting site, and reblogged it on my own blog, and now I'm sharing it here. I think it bears repeating. Blogging and writing -- As far as I'm concerned, that phrase is repetitive, redundant, and duplicates what are essentially two versions of the same word. And it does it twice. Ah, but is it fiction writing? You see, I have a saying. Well, I have many sayings, including, "To hell with anything unrefined" and "Never give a sucker an even break or smarten up a chump", but the one appropriate to this post is, "Everything is about writing." Wouldn't blogging take time away from my writing? Who would care about anything I have to say? I'll answer these one at a time. See above. Blogging IS writing. Think of it as a writing exercise, and let it energize you. How often do you want to blog? Some people say once a month, some say once a week, some say three times a week, some say many times a day. I blog once a day, every day. That's what feels good to me. What interests you? What are you up to? What is your life like, as a person and as a writer? You can focus on one thing, like Medieval Weaponry or Macrame, or you can have certain days for certain subjects. I have writers and writing on Monday, food on Wednesday, and (writing) Sample Sunday. Some Sundays, I post excerpts from my books or stories; some Sundays, I post an entire short-short story or a poem. The other days, I write about tattoos I've seen, our pets, restaurants, things that irritate me, things that give me joy, books, movies, life in my small town or out in the country. You know -- the kinds of details that enrich the fabric of fiction. People who live in the American Midwest find everyday details of life in, say, The Netherlands, exotic. People in The Netherlands find the American Midwest exotic -- or, at least, different. The general outline of your life, work, family, may be quite ordinary, but the details are specific. Nobody experiences life exactly the way you do, and it's that unique point of view that makes each person's fiction fresh and will make each person's blog fresh. Getting in touch with the specificity of your particular life is good training for creating a specificity for your characters and your settings. As an introvert who prefers listening to speaking, I’ve never found it natural to stand up and talk about myself in front of a group of people. But I learned some time ago that if I wanted to be a real, honest-to-goodness professional writer, I’d better learn how. To my surprise and relief, I’ve come to find the experience really enjoyable. One of my first public events occurred from an invitation to take part on a panel of short fiction writers at the large, fan-based mystery convention, Bouchercon in Las Vegas back in 2003. This wasn’t the most easy-going venue to begin my public speaking life, but the woman who’d invited me was a lively extrovert who would keep things going. It turned out to be great fun, and a delightful surprise when mystery writer extraordinaire, Val McDermid, joined us to take part in the Q & A discussion. Except for the occasional glitch, other panel discussions over the years went reasonably well. Although I still wasn’t comfortable facing people who were probably hoping that I'd say something insightful, I kept trying. With the launch of my first couple of mysteries, I also became a soloist. It’s still a little scary to stand before a group of people, even though some are colleagues and friends, and talk about myself. But I recently came across a saying which stated that if you’re not scaring yourself all the time by trying something new then you’re not really living. I'm paraphrasing, but you get the idea. 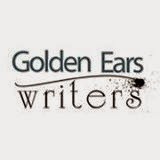 I’m going to be living front and center Tuesday, Oct. 21st, when I speak at the Golden Ears Writers event, at The ACT Maple Ridge, from 7 to 9 p.m. My topic is blending fact with fiction in mystery writing. Happily, I know something about that. You can find more on Facebook, either by clicking on the link I provided or typing in Golden Ears Writers on FB. We all know that finding reliable information on the Net can be challenging. Look up a topic and you’ll find thousands of hits but only a fraction of them will contain solid information. The same has been true in the self-publishing world for a while now. The Ebola crisis, for example, has prompted far too many fear-mongering, so-called experts without medical or related scientific backgrounds to make big bucks by giving horrible advice to readers, advice that could prove deadly. According to a recent Washington Post article, no less than 84 books on Ebola have been self-published in the last three months, and it appears that most of those people have no credentials. One of the top-selling books apparently opens with a quote from the Bible, indicating that the end of the world is coming. One bestselling survival guide maintains that 4.1 billion people could die over the next two years. Another author states that Ebola can be prevented with vitamins. Unfortunately, many people believe this nonsense. Since Amazon doesn’t censor these types of books, it’s up to the public to determine their validity, and remember to take the reviews with a grain of salt. By learning facts from the World Health Organization and Doctors Without Borders, for instance, and using some common sense, it isn’t difficult to spot the garbage books. Critics despise self-published novels for terrible editing, etc., but the more dire problem is that bad information in nonfiction could cost lives. 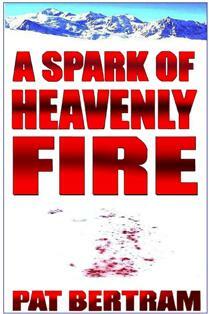 This is the premise of my novel A Spark of Heavenly Fire. The disease in the story is not Ebola, the avian flu, or any known disease, but a lab-created disease that had its origins in biological warfare experimentation. This fictional disease was created to be unstoppable, to wipe out entire populations. And it fell into the wrong hands. The Deep End is Out! 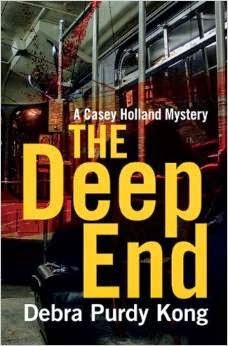 I’m thrilled to announce that my 4th Casey Holland mystery, The Deep End is now available for sale! For e-book lovers, it’s also available through Kobo, Kindle, Nook, ibooks, and others that you can find on my publisher’s website (click on The Deep End). Of course, you can also find it through bookstores and amazon. I remember when I wrote the first page. It was just over four years ago and I was working in campus security back then, patrolling the grounds on a sunny Sunday morning in July. At that time, nearly every building was closed, but we were supposed to patrol them anyway. Wandering through empty buildings was quite relaxing. The experience allowed my mind to wander and explore ideas. On my break, I took out a piece of scrap paper and began to write the first lines. At the end of that summer, I left the security business, with the first two chapters of a new book in my hand. Four years might seem like a long time to finish and then publish a book, but the production process usually takes about a year. Also, between my blogs, book reviews, and other novels in progress, I always juggle several projects at once. Truthfully, I don’t know what it’s like to work on only one book. This book made me reflect on my volunteer days at a youth detention center many years ago. Even back then, I was writing a journal, (although not planning to become a writer), and had the good sense not to throw the journals away. Reading entries from the late 70’s was an eye-opener in many ways. Above all, it made me glad that I wrote those experiences down. I’m close to finishing book five now. Hopefully, this fall. And then we’ll see what the future brings.